Liberal, Kans.— Contest winners read their poems Friday evening at Seward County Community College’s ninth annual Poetry Coffee House, which also featured Kansas Poet Laureate Kevin Rabas, contest judge. Kevin Rabas read his poems, some accompanied by drums, to a packed house; around 90 people attended. Rabas noted that the Coffee House drew the biggest crowd of any poetry event he has been to during his time so far as poet laureate. For the first time, a new Young Poets Category was offered for students in grades six-10. The contest drew 116 entries this year. In addition to the poet laureate and contest winners, the evening also featured several students from Colvin Adult Learning Center sharing their poems. Instructor Bill Asmussen uses poetry in his ESL lessons and noted that most of his students who read their poems Friday evening could not even speak English two years ago. SCCC English instructors Janice Northerns and Josh Paulus also read some of their poetry. Live music for the evening was provided by SCCC students Biviana Rodriguez, Arturo Don Juan, and Alfredo Banuelos. 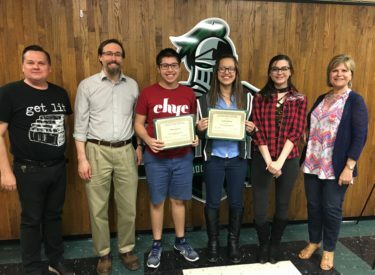 In addition to the two scholarships, poetry contest prizes included signed copies of contest judge Kevin Rabas’s books, cash awards, Magnetic Poetry sets, Pizza Hut coupons, Freddy’s Coupons, a Saints Bookstore gift card, and SCCC merchandise. The contest and Poetry Coffee House are annual events, and plans are already in the works for April 2019.